Point Pleasant junior Nick Parsons (42) barrels over a Warren defender for a touchdown during the first quarter of Friday night’s Week 3 football contest at OVB Field in Point Pleasant, W.Va. Forget orange, red has become the new black. Sporting red jerseys for the first time since the mid-1970s, the Point Pleasant football team was well on their way to moving to 3-0 this year after taking a 54-0 advantage into halftime of their Friday night gridiron contest against Warren. The Big Blacks stormed out to a 51-0 advantage with 7:55 remaining in the second quarter, but then a delay followed because of lightning. PPHS tacked on a field goal just before the half when play resumed, and the game was in the process of concluding as of press time. Wahama fell to 0-3 and still has yet to reach the scoring column through 12 quarters of play following a 43-0 setback to visiting Southern. The Hannan at Manchester contest result was also unknown as of press time. All three Mason County programs are at home next Friday with kickoff times at 7:30 p.m.
Point Pleasant welcomes Herbert Hoover to OVB Track and Field, while Belpre comes to Bachtel Stadium to face the White Falcons. Hundred also visits the Craigo Athletic Complex to take on the Wildcats. 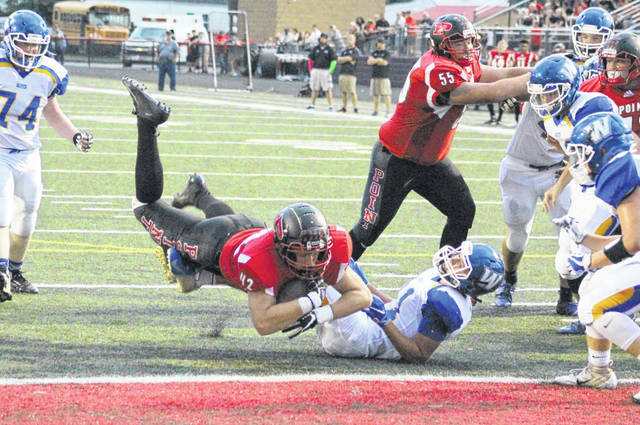 Due to an early deadline, the Mason County football games from Week 3 will be available — if information is received — in the Tuesday sports edition of the Point Pleasant Register. Game stories will be available online at mydailyregister.com before appearing in print.